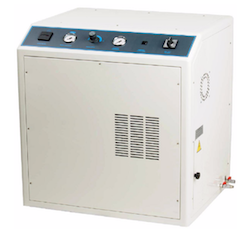 CH Technologies offers the Reduced Noise Compressor. It is designed to reduce noise levels by 20 dB/A when the application requires quiet, oil free, and dry air. State of the art control panel features the following items: Hour meter, Pressure regulator, Tank pressure gauge, Line pressure gauge, Thermal overload protection, Main ON/OFF switch. Tank Size : 13 Gal / 50 Lt.